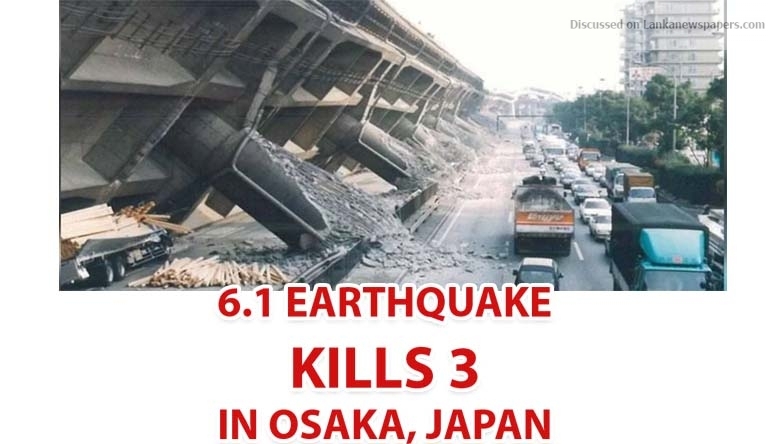 Reuters- Three people were killed and more than 73 were injured on Monday (June 18) after walls collapsed due to a magnitude 6.1 earthquake that hit Osaka, Western Japan. The earthquake had hit Western Japan early in the morning just before 8.00 a.m. (2300 GMT Sunday) and the epicentre of the earthquake was in the northern part of Osaka, Prefecture and according to reports no tsunami warning was issued. Among those killed were a nine-year-old girl and two other elderly men of ages 85 and 80. Several roads suffered severe damages and water pipes burst, sending water flowing onto streets in Takatsuki city where the biggest shock was felt due to the quake. According to Kansai Electric Power Co. Japan there were no irregularities at any of the nuclear plants in the region after the quake, but there were more than 170,000 households without power in Osaka and in the neighbouring Hyogo Prefecture which were resolved within hours of the quake.